Also: PA Hunt Cup kicks off Nov. The 81st Pennsylvania Hunt Club takes place Sunday in Unionville. With October having five weekends this year and Halloween falling on the final Saturday night of the month, the area’s event calendar has been thrown off a bit. Many of the activities that usually are scheduled for the beginning of November are slated for the weekend of November 6-8 this year. Obviously, the calendar for this weekend features a huge variety of Halloween attractions and events. And, there are still a lot of things not related to Halloween to keep you entertained until the next work week arrives. 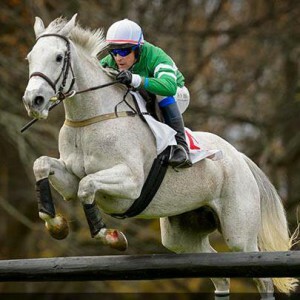 The Pennsylvania Hunt Cup (Pennsylvania Hunt Cup racecourse, Newark Road, Unionville, 484-888-6619, http://pahuntcup.org) is one of the oldest and most respected equestrian events in the Mid-Atlantic region. This year, the Hunt Cup will celebrate its 81st anniversary on November 1. The equestrian competition will feature four open races sanctioned by the National Steeplechase Association. Three of them will feature races over fences and one will be a race on the flat. The challenging course features 22 post and rail fences and is one of the few select four-mile races sanctioned by the National Steeplechase Association. Another popular race is the children’s Pennsylvania Junior Hunt Cup. Gates open at 11 a.m. with the first event — the Pennsylvania Junior Hunt Cup — scheduled to start at noon. There will be the traditional “Carriage Parade” at 1 p.m. followed by the Lewis C. Ledyard Memorial Foxhunters Chase at 1:30 p.m., the Arthur O. Choate Jr. Memorial Trophy race at 2:15 p.m. and the Pennsylvania Hunt Cup at 3 p.m. The final race of the day will be the Athenian Idol Race at 3:30 p.m. Traditionally, the Pennsylvania Hunt Cup has had a number of local conservation organizations as beneficiaries. For 2015, the beneficiaries are Chester County Food Bank, Work to Ride and Upland Country Day School. General Admission, which is $50 per car, includes parking and admission for all occupants of one vehicle. The Brandywine River Museum (Route 1, Chadds Ford, 610-388-2700, www.brandywinemuseum.org) will host its “Fall Harvest Market” on October 31 and November 1 and again on November 7 and 8. Visitors will be able to shop for everything from honey and apples to pottery and handcrafted jewelry. Regional artisans will be showcasing their crafts in the museum’s courtyard. Regional artisans will be showcasing their crafts in the museum’s courtyard. Hand-woven rugs, quilted items, pottery and handcrafted jewelry and more will be offered on a rotating basis. Longwood Garden’s 34th Annual Mum Fest continues this weekend. Longwood Gardens (Route 1, Kennett Square, 610-388-1000, www.longwoodgardens.org) celebrates autumn with its annual Chrysanthemum Festival every year. The 34th Annual Mum Fest, which runs through November 22, is an expansive exhibit featuring more than 20,000 colorful, blooming chrysanthemums in Longwood’s huge conservatory. Longwood’s horticulturalists have grown and developed the mums into a variety of unusual forms. They have groomed chrysanthemums to resemble clouds, torches, spirals, fans, 13-foot arches and more. This year, Longwood has the largest chrysanthemum outside of Asia on display. Grown at Longwood, the plant is expected to produce over 1,500 perfectly placed, uniform blooms on one plant. Another attraction is Longwood’s “Autumn Days,” an event that opened in September 12 and is running through November 22. Right now is an excellent time to take a nature walk in Longwood’s Meadow Garden, where visitors are surrounded by colorful flowers and meadow grasses. Admission to Longwood Gardens is $20 for adults, $17 for seniors (62+) and $10 for students (ages 5-18). This is also the final opportunity for visitors to Longwood Gardens to enjoy “Nightscape: A Light and Sound Experience.” The installation, which will be open through October 31, brings the garden to life after dark with colorful lights and moving images that are choreographed to music. “Nightscape” is set in various areas of the garden — Rose Arbor, Large Lake, Flower Garden Drive, Legacy Tree, Flower Garden Walk, Topiary Garden, East Conservatory and Silver Garden. The installation will open every day at sunset. “Nightscape: A Light and Sound Experience” was created by Philadelphia’s Klip Collective, a group known for its impressive installations at the Philadelphia Flower Show. Longwood will also host a variety of special events during “Nightscape,” including a new beer garden in collaboration with Victory Brewing Company. Video link for “Nightscape” — https://youtu.be/PtY-nRxWzhA. Tickets are $27 for adults, $17 for students (ages 5-18) and free for children (ages 4 and under). “Mischief Night,” which took place the night before Halloween, was (and still is) “all trick” and “no treat.” Those who remember “Mischief Night,” probably also remember their parents telling them to stay at home so they wouldn’t get in trouble. 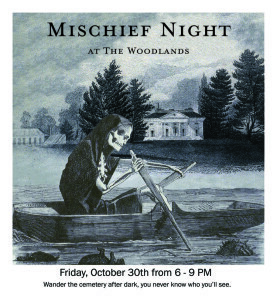 You can celebrate “Mischief Night” on October 30 at a special event called “Mischief Night at the Woodlands.” The Woodlands (4000 Woodland Avenue, Philadelphia, 215-386-2181, http://woodlandsphila.org) is a 54-acre undulating landscape that is a one-of-a-kind 18th-century English pleasure garden and a 19th-century rural cemetery. Tours, which start at 7 p.m., will last approximately one hour and depart every half-hour, with the final tour departing at 9:30 p.m. The cost is $20 per person general admission. Tickets can be purchased at the door, by phone or online. Upon arrival, guests must register at Laurel Hill Cemetery’s Gatehouse entrance, 3822 Ridge Avenue, Philadelphia. 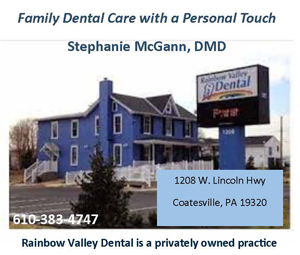 Free parking is located in the lot directly across the street from the Gatehouse. If you’re looking for something to do this weekend that’s a hoot, check out the “Halloween Owl Prowl” at Bucktoe Creek Preserve (432 Sharp Rd, Avondale, www.bucktoecreekpreserve.org0. The nature-oriented event, which is being presented by The Land Conservancy, will be held on October 30 from 5:30-7:30 p.m. Visitors are invited to spend a spooky evening exploring Bucktoe Creek Preserve’s woodland habitat looking and listening for owls. Great Horned, Eastern Screech, and Barred Owls are known to roam the preserve. Participants are encouraged to come dressed in costume or just come as they are to join in the fun. Admission is $5 for The Land Conservancy members and $10 for non-members. On October 31 and November 1, Paradocx Vineyard (1833 Flint Hill Road, Landenberg, 610-444-9003, www.paradocx.com) is presenting its final Family Fun Fest of the year. Families are invited to partake in an afternoon of barnyard games, a corn maze and wine (adults only). On Saturday and Sunday from 1-6 p.m., Paradocx will be partnering with Cool Breeze Gourmet Greens to host barnyard activities for all ages. The list of activities includes Corn Maze, Peddle Carts, Corn Canon, Hayride and more. Tickets are $1 each & ticket amounts vary per activity. The free event will be held weather permitting. All children must be accompanied by an adult. This weekend, the Greater Philadelphia Expo Center (100 Station Road, Oaks, 610-529-3614, http://www.fanaticsauthenticshows.com/shows/philadelphia-oct-30-nov-1) will host the Fanatic Authentic Sports Spectacular. The show will feature appearances by some of the biggest names in Philadelphia sports over the course of three days. Athletes in attendance will be available for meet-and-greets, photo-ops, and autograph signings. The roster of football greats includes Bo Jackson, Andy Russell, Jack Ham, Jack Lambert, Jim Kelly and Joe Greene. Representing the U. S. National Women’s Soccer Team that just won the World Cup will be Carli Lloyd and Christen Press. Many former baseball all stars will be participating including Brooks Robinson, Darren Daulton, Greg Luzinski, Jim Palmer, Mike Schmidt, Pete Rose, Ryan Howard, Steve Carlton, Ozzie Smith and Cal Ripken, Jr. The line-up of Philadelphia Flyer alumni features Larry Goodenough, Bernie Parent, Andre Dupont, Bill Barber, Bob Kelly, Bill Clement, Bobby Clarke, Dave Schultz, Don Saleski, Ed Van Impe, Gary Dornhoefer, Jim Watson, Joe Watson, Orest Kindrachuk and Rick MacLeish. There will also be a number of members of the Philadelphia 76ers’ 1992-1993 NBA champion team — Billy Cunningham, Julius Erving, Bobby Jones, Clint Richardson, Earl Cureton, Clemon Johnson, Franklin Edwards and Reggie Johnson. The show’s hours are 4:30-9 p.m. on October 30, 9:30 a.m.-5 p.m. on October 31 and 10:30 a.m.-4 p.m. on November 1. Admission is free. The UniverSoul Circus (52nd Street and Parkside Avenue, Philadelphia, 800-345-7000, www.unniversoulcircus.com) will be treating circus fans to a whole new experience. Celebrating 21 years under the big top, UniverSoul Circus features music, theatrical performances, incredible circus acts and loads of fun. You’ll see flashy Caribbean dancers from Trinidad, acrobats and high-flying trapeze artists from China, mind-boggling contortionists from Ethiopia, funny clowns from South Africa and Guinea, plus lions, zebras and much more. The roster of acts on this year’s tour includes the Wuhan Flying Trapeze, Trinity (gymnastics), the Navas Wheel, Black & White (zebra act), Globe of Death, Color Me Caribbean (dance), The African Dream (wire act) and Fresh the Clownsss. It’s all held together by Lucky the Ringmaster and Sidekick Jake. The circus is in town now through November 15 at its site in Fairmounht Park. Ticket prices range from $15-$35. With the “Day of the Dead” arriving this weekend, most Halloween activities are heading down the home stretch. A few will continue through next weekend but most will wrap up either this Saturday or this Sunday. The following is a look at what’s left on the Halloween event calendar. Penns Woods Winery (124 Beaver Valley Road, Chadds Ford, 610-459-0808, www.pennswoodswinery.com) is presenting a special event this year called “Painting in Pumpkinland” on October 31 from 11 a.m.-4 p.m. Participants will be able to choose their pumpkins from the Penns Woods Pumpkin Patch and decorate them — Paint them, sticker them, glitter them and more. The cost is $15 -18/per pumpkin (depending on size). Price includes pumpkin and all decorating materials. Music will be performed by Pete Marziano. Another popular corn maze in the area is running now through November 7 at Cherry Crest Adventure Farm (150 Cherry Hill Road, Ronks, 717-687-6843, www.cherrycrestfarm.com). The main attraction is Cherry Crest’s “Amazing Maize Maze.” Billed as “the world’s most dynamic and interactive corn maze,” it is a five-acre corn maze with over two-and-one-half miles of paths, scenic bridges, and clues. There will also be a “Flashlight Maze” every Friday and Saturday night. Tickets are $17 on Thursday and Fridays and $20 on Saturdays. “Candlelight Ghost Tours” (Fort Mifflin, Fort Mifflin and Hog Island roads, Philadelphia, 215-685-4167, http://fortmifflin.us) are scheduled for October 30. Visitors can tour historic (and haunted) Fort Mifflin by candlelight from 7-10 p.m. each night and hear tales both historic and haunting on a candlelight tour of National Historic Landmark Fort Mifflin. The Garden State Discovery Museum (2040 Springdale Road, Cherry Hill, New Jersey, 856-424-1233, www.discoverymuseum.com) is holding its Third Annual Halloween Hootenanny on October 31 from 6:30-8:30 p.m.